* Polartec® Classic 100 Micro Velour Small Grid—100% polyester, 152 g/m². This fabric rapidly wicks moisture away from the skin, while still being highly breathable and ultra light. Delta LT Jacket - Mens (Prior Season) is rated 4.4 out of 5 by 22. Rated 5 out of 5 by ShredAK from My Go-To Jacket I have worn this jacket essentially every day for the past several years. It is by far the most useful jacket I own, and I own a lot of them! The best layering piece I have, whether it's summer or winter, it is the first thing I put on when my baselayer isn't cutting it. It's breathable enough for high output activities, but blocks the wind just enough to stand on its own on many alpine hikes. Being that I'm a field biologist in Alaska, I abuse this thing to no end and it is still going strong. Light, durable, warm - this is a quintessential Arc'teryx piece. Rated 5 out of 5 by Easy from Zero complaints because it's perfect! Title says it all. This jacket is light enough to be worn on mildly warm days (mid-60s) and warm enough to wear when it's cooler out as a mid-layer under a soft or hardshell. Excellent fit, albeit a tad roomier than the advertised "trim fit" but that's just fine. I haven't carried yet with this jacket, but I doubt there would be much issue with printing and the slight drop-back hem would likely keep anyone from noticing your EDC kit. This is probably my favorite Arc midlayer that I've purchased. Rated 5 out of 5 by Will from Beautiful Jacket/Sweater/Midlayer piece The Polartec fleece is super soft both on the inside and outside. I have an old Polartec fleece sweater from Patagonia that's twice as thick which was my standard sweater, but when I tried on the Delta LT, immediately I could feel it was much warmer, which was a nice unexpected surprise. 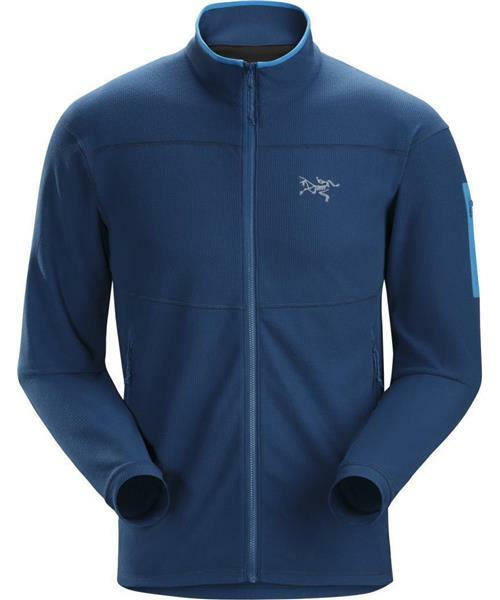 It's more like a jacket/sweater in that it's very thin and extremely light, and true to its thin fit with the sleeve length is just a bit shorter than other outer layer Arcteryx jackets, but that's just perfect. Hopefully it will be durable without any pilling and stand up to tons of washing as I expect to wear this all the time for almost every activity. Got both the red and silverstone jackets, the silverstone color is a little darker than expected, kind of more off-white to blueish tone. The red shows off nicely, not too dark, not too bright. Rated 5 out of 5 by thomas from This is THE midlayer Polartec Classic Micro - the wording doesn't sound like there would be anything innovative in the material. It rather gives them impression that this jacket is made out of some old fleece being around for ages. Well, I don't know long Polartec Classic Micro is on the market. But in my opinion it is defenitly one of the top of its class. It's incredibly warm for its weight outclassing some polartec powerstretch pullovers I have bought in the past from other companies. And it has also incredibly wicking capacities. I'm wearing the Delta LT currently over a phase baselayer and under the acto mx or the gamma mx while cross country skiing at temperatures between -5 and -12 C and I feel fine. No overheating, no soaking in sweat. These three pieces just make a great combo. In the summer time, I take this along on mountaineering trips to proctext myself against the chill during breaks or on ridges. The Delta LT does not only provide warmth, it also helps wicking the sweat out of the baselayer, keeping you warm and dry during rests. On top of that: it weighs almost next to nothing and folds down incredibly small. So there's always a place for it - even in a Aerios 14 together will an Alpha FL, some water and some energy bars for fast and light trips. The Delta LT also does a good job as a light belay jacket in the climbing hall, when the ventilation is blowing full steam in the winter time, blowing in cold air while your partner needs some extra time to check out his next moves. Rated 5 out of 5 by NIk38 from Good Quality I have heard of Arc'teryx but could never afford the clothing, however this jacket has proved me wrong. I was a bit worried as i was used to the well known brands. As soon as i put the jacket on it felt comfortable and was very roomy. It also goes well under my eVent jacket. Very warm and looks good on its own. Very Impressed. When Walking, its light and breathable where some fleeces have let me down previously. All in All this Jacket is very well made and i will be certainly be buying more from here. Rated 5 out of 5 by Fasanko1 from Fantastic Fleece I love this jacket. It is light as a feather and yet has surprising warmth. I'm 5ft 9", 205 lbs and large fits great. I can almost fit into medium but it is a little snug around the middle and chest. I can see how this will soon become my favorite garment. Cuffs are just snug enough to keep from sliding over your wrists. I have a similar micro fleece jacket from Mountain Hardware and the cuffs are to generous and they slide over your wrists and annoy you. Way to go Arc'teryx. Rated 5 out of 5 by MikeA from Great mid layer or standalone piece This is a thin and lightweight fleece good for summer cooler days under a thin shell or as a standalone piece. Unfortunately, there is no hook to hang it on the inside back.